AeroCat LLC, an Indiana based high performance bicycle manufacturer, is pleased to announce the availability their second new bicycle in less than a month. The AeroCat T600 triathlon and time trial bicycle was designed for high aerodynamic performance. It is immediately available with two standard complete bike configurations and several customized options for a bicycle to meet virtually any rider's needs or preferences. The T600 utilizes AeroCat's unique carbon monocoque frame design and manufacturing process. "We started the design process with no predetermined conventions," said AeroCat President Dave Poole. "Every tube and surface was design for maximum aerodynamic performance including typically overlooked areas such seat stays, chain stays, and seat post. Shifter and brake cables are internally routed to maximize aerodynamic efficiency. The bike is comfortable, stiff and as fast as it looks." Frame sizes for the T600 come in 53cm, 55cm and 58cm. AeroCat's T600 is available with two standard complete bike configurations that include either a full SRAM Rival build or a Shimano Ultegra SL build. Both configurations come with a Profile Carbon Cobra Wing Bar, Profile Carbon T2 Cobra AeroBar, Cane Creek Brake levers, Reynolds Solitude Wheelset, and Velo Pronto Tri Saddle. Numerous component upgrades are available for the unique needs of individual athletes. 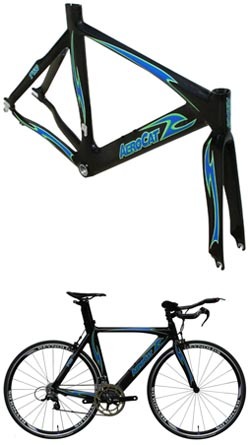 For frame geometry and more detailed information can be obtained by visiting http://aerocatbike.com/Products/T600.pdf. Monocoque 3K carbon fiber construction. Natural carbon weave finish with clear coat. Ultra reinforced bottom bracket area to provide maximum stiffness and energy transfer. Fully adjustable aerodynamic seat post with dual saddle mounting positions. 76 Degree seat tube angle. Internal cable routing for shifters and rear brake. Horizontal dropouts with internal hex nut set point for rear wheel location. Available in 53, 55, and 58 frame sizes.